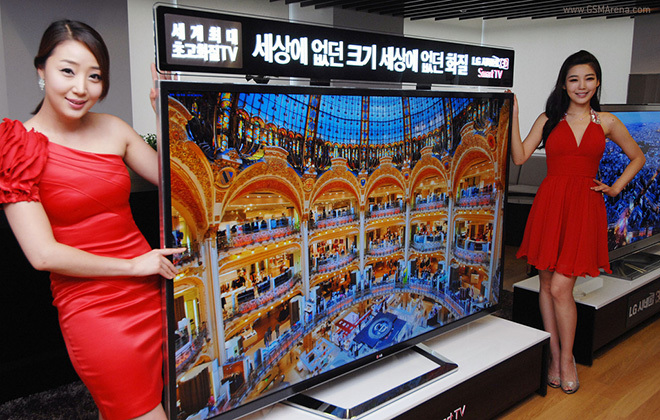 LG has launched the world’s first 84-inch ‘Ultra Definition’ 4K 3D TV in Korea, with plans to release in international markets soon. This gigantic panel has a resolution of 3,840 x 2,160, which is basically four times the resolution of a 1080p display. The TV, which is named 84LM9600, comes with LG’s Cinema 3D and a whole bunch of other features with 3D in the name. You also get a pair of passive 3D glasses for viewing the 3D content. While on paper, this display sounds fantastic, but the reality is that there is very little 4K resolution content available at the moment, which means most of the time you’ll be looking at 1080p content quadrupled to its original size, on an 84-inch panel. This, along with the 25 million won (US$22,105) price tag, makes the whole thing hard to swallow. But if you’re someone who has loads of money to spend and want the absolute best TV to watch all the videos you shot using your RED Scarlet camera then this should make a great buy. The LG 84LM9600 is out in South Korea right now and will be available in North America, Europe, Asia, and Latin America starting in September.